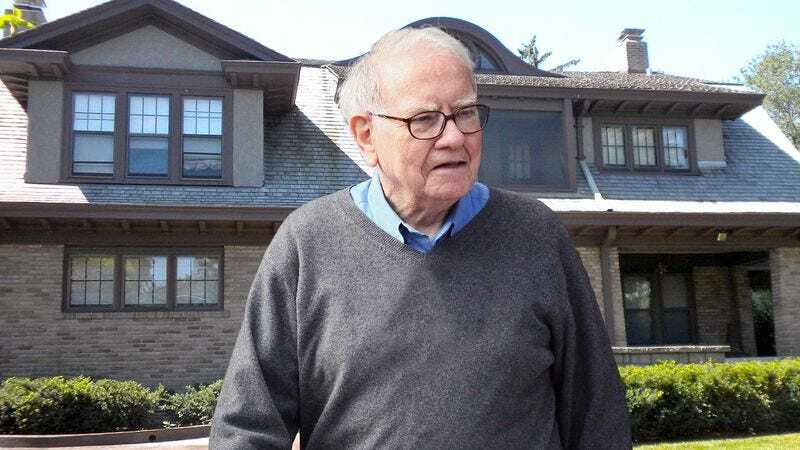 OMAHA, NE—Shaking his head as workers installed a fountain on his neighbor’s front lawn, business magnate Warren Buffett told reporters Wednesday that he cannot believe he’s stuck living next to the latest recipient of a Powerball jackpot. “Oh, what a treat, I get to be neighbors with some guy who walked into a gas station one day and asked a computer to pick six numbers,” said the multibillionaire investor, closing his window to avoid hearing the electronic dance music blasting from the $600 million prize winner’s poolside speaker system. “A Lamborghini, too? How original. I have no idea where this chump was living last week, but I give him one, two years tops before he blows it all and has to crawl back with his tail between his legs.” At press time, the so-called Oracle of Omaha was instructing his personal assistant to politely decline his neighbor’s invitation to go bison hunting together from his new helicopter.